*Mountains re-release this excellent slab of organic electroacoustic drone on Thrill Jockey* Following on from his exceptional Type long-player, Field Rituals, Koen Holtkamp regroups with cohort Brendon Anderegg for a long-awaited new Mountains release. Previously encountered on the duo's own Brooklyn-based Apestaartje label, the Mountains sound proved to be one of the most organic and natural examples of how acoustic instrumentation and digital electronics might be merged together. Plugging guitars into laptops seems like the oldest trick in the book, but in terms of outright creativity and maintaining a grasp on the sheer joy of sound, Mountains are right up there with the very best of them. 'The Whale Years' encapsulates so much of what the duo are about: evoking a spontaneous feel whilst retaining the kind of pristine sound world that could only be created in a studio. The track opens with passages of glistening tremolo, gradually welcoming the gentle crackle of environmental recordings, all buffeted around with granular dissections of guitar phrases, creating swirls of encoded melody. 'Nest' proves to be a little less grand, opting for the intimate approach with its fingerpicked acoustic rolls, all cradled in manipulated field recordings from some undisclosed exterior location. There's a clear separation between instrumental and acousmatic sources here, but flip over and 'Millions Of Time' melds the two components brilliantly: it's rainy soundworld gets looped and layered in such a fashion as to create a kind of beat from the dripping water. The most obvious reference point here would be GAS' Konigsforst - there's something dense and orchestral about how the sounds all swell up together, with a few flugelhorn-like tones cutting through the sound mass, implying a subtle melodic motif. Finally, 'Hive' takes us into the kind of noisy terrain occupied by Tim Hecker or Fennesz. The instruments all consumed by a clump of fiery digital sound-mass, with chords torn apart by distortion in a strangely ambient way. The various pieces gathered together for this LP were recorded under fairly disparate circumstance; the entire B-side is made up from pieces previously released as an obscure 3" tour CD-R and that opening cut, 'The Whale Years', was - quite unbelievably - made up on the spot in a hotel room. 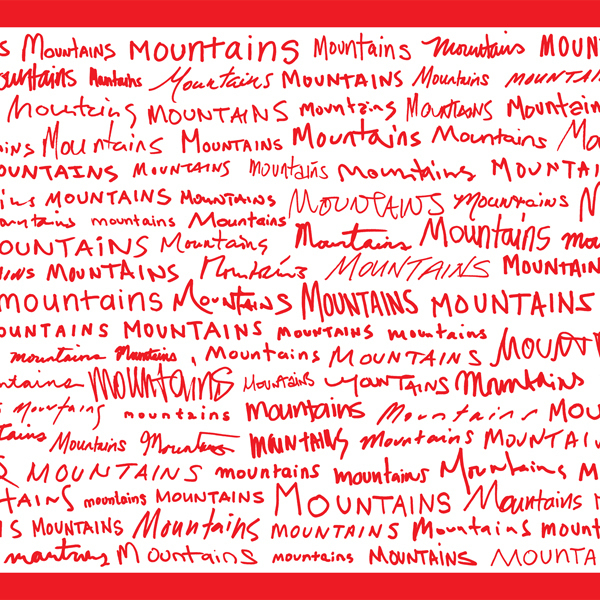 Despite that there's an undeniably unified sound to 'Mountains Mountains Mountains', and it's one of the most well-rounded and accessible drone records in the Mountains canon.